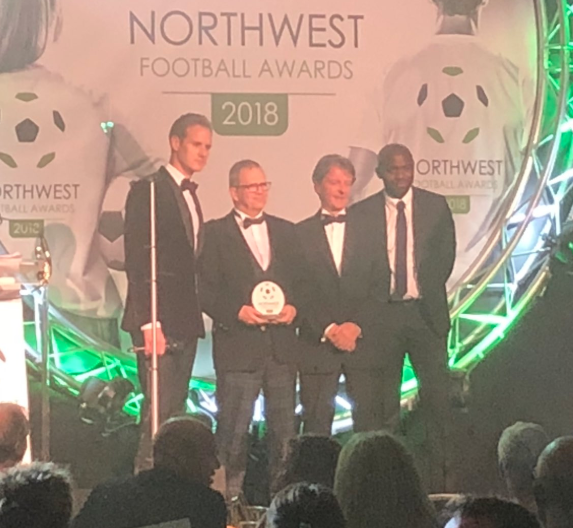 Congratulations to Grant Downie who was awarded the Fabrice Muamba Award for Outstanding Service to Football Medicine and Performance at last nights’ North West Football Awards. Grant’s distinguished career spans over 32 years at the heart of professional football and elite sport including full time and advisory positions at Middlesbrough FC, Glasgow Rangers FC, Team GB, the Scottish FA, Premier League as well as his most recent post as Head of Performance at Manchester City Academy. Congratulations are also extended to Accrington Stanley FC’s Paul Caton and Bolton Wanderers FC, Matt Barrass who too were nominated for this award. The event, held at Old Trafford Cricket Ground, celebrated the achievement of clubs and individuals throughout the football leagues and beyond.